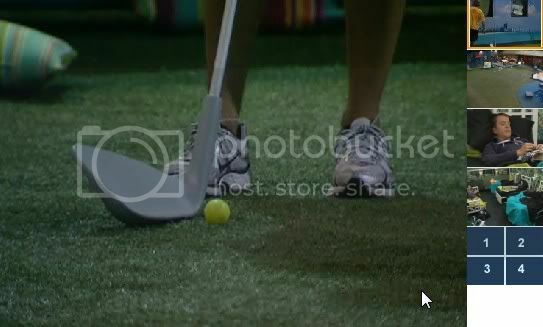 Playing for POV: Andrew, Kathy, Matt, Lane, Brendon, and....Rachel! Brendon into the safari room with Ragan and Britt. Ragan wishing they had a cement slab to sleep on. Lane and Hayden are playing golf but keeping score as if it were baseball. They are taking turns hitting the ball but for each of them they are keeping track of what inning they are in, how many outs and who is on base. Sounds like Hayden is winning. Hayden - bases loaded with 2 outs. Lane has someone on 1st and second with 2 outs. FF to bathroom with Kristen and Rachel. Ragan, how many people have not been a have not so far? Hayden hit a really high one htey were afraid they were going to lose the ball. Lane - runner on first, one out. hayden - so we both have runners on first one out. (I'm not sure what inning each of them are on or what the score is). Hayden - how about on a grounder if we field it cleanly it is an out, otherwise it is single. Kathy is telling her that she is not going to campaign against Andrew. She realized that Andrew is her friend to and to campaign would just not be her style. I have to take off now. Feeds 1/2 are back to the ball game in the BY. Lane and Hayden are still smacking that ball around. Rachel out of the shower and gave something to brendon and left again. Lane's shot hit the window. It didn't break. Ragan wants to go to bed. Enzo's watching the game. He sings "solid as a rock" and we have WBRB. Hayden's explaining the rules to Andrew. They're a bit confusing. Matt comes outside. Says he was in the diary room for two hours. WBRB. They flip to Ragan/Matt/Enzo in the cabana. Ragan says he wants to go to bed early. Enzo and Matt say the Veto competition will be fun. Brendon comes in and asks if Enzo made anything to eat. Enzo said something slop. Brendon said that the have no food made him go to the bathroom twice. Ragan says they picked players for the Veto early because last week they woke up at 7:45... WBRB. Back with Enzo saying that he gets major air time. 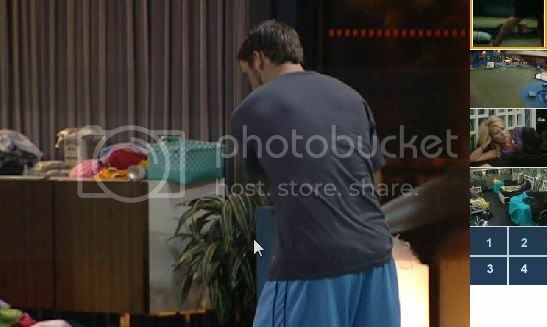 Matt says he was in the diary room for 90 minutes. WBRB again. Enzo says the Vet competition will be a physics test or a swim meet. Ragan says the name of the competition will be chain smoke. Or who can read Hebrew the fastest. The boys are laughing in the cabana. Matt says this season has been rigged so far. Ragan says half the house is playing the Veto.